The first big surprise was just how difficult and exhaustive the work could be, from patrolling the beaches in ankle-deep sand during the wee hours of the morning or night, to digging arms-deep artificial turtle nests to relocate badly placed eggs; the work was not for the light of heart. Upon arrival we were given a brief presentation of the work that was expected of us (and although I was helping coordinate volunteers I also took on the role of a volunteer since everything was new for me), and how the night patrols would work. This was followed by a second presentation of the anatomy of various turtles we work with and how endangered some of them are, as well as how worldwide conservation efforts are helping to increase their likelihood of survival. Between recoveries from previous night or morning patrols, we did a variety of jobs during the day as well. Some days we built baskets for the hatchery that will soon open, reconstructing nest covers, beach clean-ups, excavations of nests that had been hatched, and beach searches for new hatchlings. Perhaps the most difficult and important work of all though, were the night patrols that I previously mentioned. However testing the night walks may have been, they were the most rewarding and provided the most hands-on work for rapid learning. 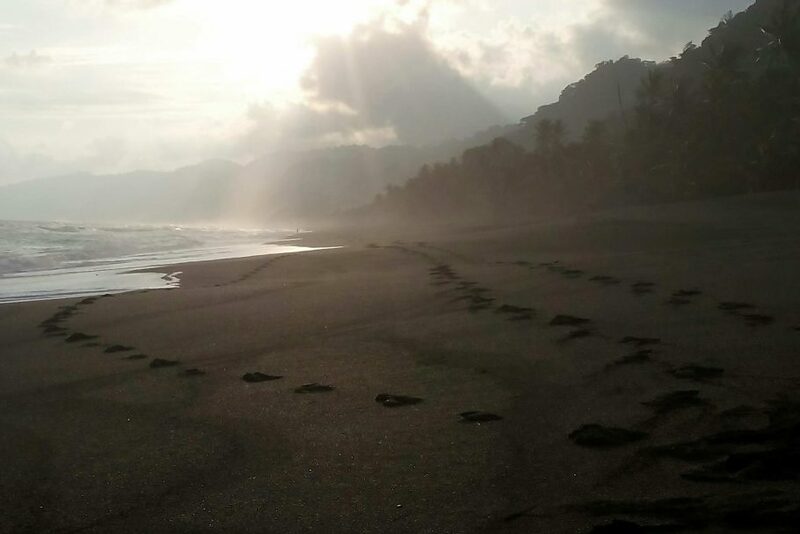 Patrolling basically entailed going to the beach during peak activity for the turtles, where we (the assistants, the volunteers, and I) would walk along the beaches back and forth to look out for turtles and inhibitors to their nesting such as dogs, poachers, or high tides. Each patrol was perfectly timed with the tides to make sure we were on the beach when the most sea turtles could be found to optimize our efforts in protecting their nests. Night patrols entailed bioluminescent sand that lit up like mini galaxies as we walked, nesting turtles leaving and returning to the sea, measuring the turtles as they laid their eggs for future data, the inspection of nests to ensure their eggs hadn’t been poached or eaten by animals, marking already laid nests, and the relocation of nests (we did this only when a turtle had laid eggs in a place that would lower the chances of survival for the eggs). Some nights were more successful than others, in that some nights there were many turtles and nests, while other patrols there were none (this could be accounted for by the full moon, turtles hate light for nesting- make sure you turn off your lights if you are staying in a beach hotel or house!). Despite having a lack of activity during unsuccessful nights, the inexplicable beauty that surrounded us each night made every patrol special in its own way. Having been given the opportunity to work in an incomparably special environment, while working to conserve some of the world’s most timeless species, will surely be a highlight of all of my travels. 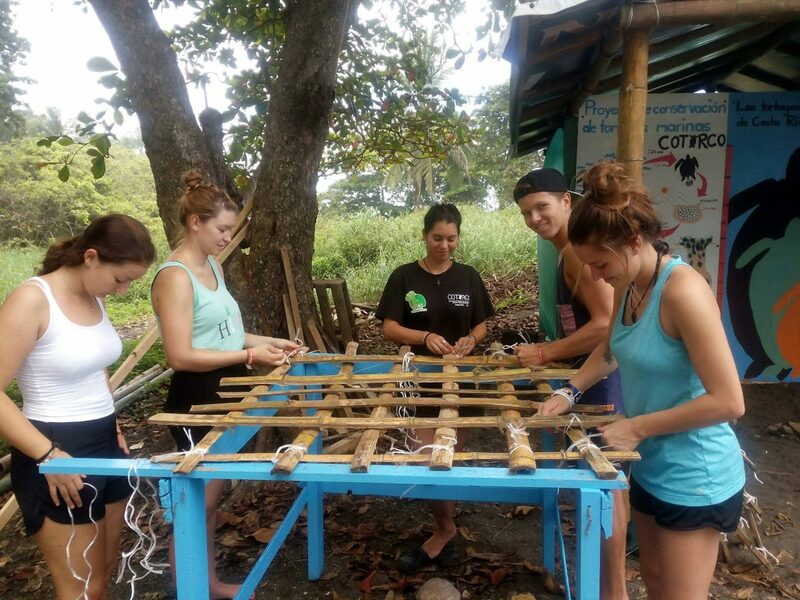 Working in Carate was an experience that impacted me immensely after having seen the fruit of our efforts, and I came out with a whole new array of knowledge and deeper understanding of the mechanisms of sea turtle conservation. A huge thanks to the team at Planet Conservation (Beate and Federico), the assistants in the project (Courtney and Attenea) and the volunteers who make our projects possible. After having experienced the project firsthand, I now have the utmost respect and admiration for all of those who work so tirelessly and passionately in sea turtle conservation. It was an experience I will never forget. Ask for your drinks without straws, or sin pajilla in Spanish. Use reusable bags instead of plastic, or sin bolsa. Avoid buying jewelry or souvenirs that use turtle shells as decoration. Travel consciously through programs that support rather than hurt sea turtle conservation, E.g. horse riding tours that do not ride their horses through known nesting areas (the horses are notorious for breaking eggs in nests along the beach with their hooves!). If staying on a beach at night where turtles are known to lay their nests, turn off all bright lights during the night. Also avoid going onto the beach at night with bright white lights and use the red light option instead. If you live near the sea, organize a beach clean-up in your area. 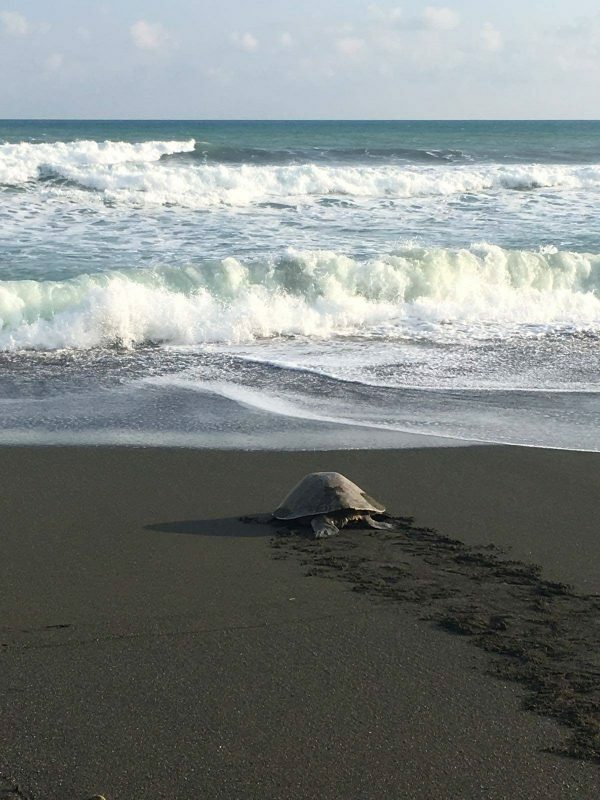 Donate to authentic programs working in sea turtle conservation.